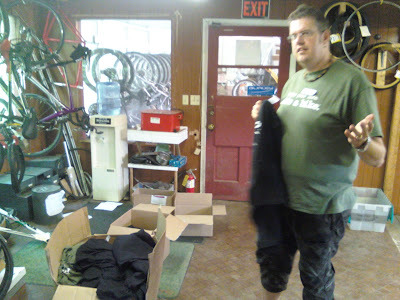 Century Cycles Blog: We've got t-shirts! We just received a fresh batch of our Define your life. Ride a bike.tm t-shirts! So, for any of you who bought a bike recently and did not get your free t-shirt because we were out of your size, stop in soon with your IOU cards! Thanks to Aubrey, one of the new people in Peninsula, for spending most of the day this past Saturday folding them! Shown here is another new guy, Rich, taking his turn at folding duties. Hey, I know Rich!! He's working for you now? COOL!! Rich rides a beautiful Martian green and black Raleigh road bike. ;) I suffered bike envy the first time he brought that around our bike club... (and I know everyone by their bikes).